The 28th Annual FAPPS Conference will be held March 8, 9, 10, 2019 at the Marriott Orlando Lake Mary. The striking decor of the Orlando Marriott Lake Mary has a distinctive flair, featuring Marriott's Great Room Lobby, including the Espresso Lounge, Proudly Serving Starbucks coffee. Cobalt's lounge and Bistro 1501, with its fresh contemporary cuisine, are ideal for business or social entertaining. Custom-crafted Eurpoean furnishings, luxurious 300-thread count linens, paired with granite and marble bathrooms, provide the background for the conveniences that make taking care of business at the Orlando Marriott Lake Mary a pleasure. Guest rooms offer complimentary wired and wireless high-speed Internet access, speaker phones, irons/boards, and hairdryers are among the many in-room conveniences. 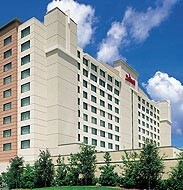 The hotel is ideally located within walking distance of Lake Mary's top restaurants and many Fortune 500 Companies. There are many opportunities available to advertise your services and sponsor the annual conference. Your sponsorship enables us to help keep costs low to allow more members to attend than otherwise possible. FAPPS has one of the largest process server state association conferences in the nation. By exhibiting at our annual conference you will be introduced to process servers from not only throughout Florida, but nationally. Our exhibit hall and conference schedule are designed to provide a maximum amount of valuable exposure to reach our members throughout the conference. FAPPS thanks our sponsors and exhibitors for their generous support to provide our members with exceptional education and networking opportunities at our annual conference. TSI Legal – Joe Osborne, Jr.